Samsung TVs (smart/3D/4K TV) are very popular in the market; many customers bought Smart TV to play high-definition movies on it. Nowadays it is convenient to put movies on Seagate NAS and play on Samsung TV via USB port but if you wish to enjoy your movies and videos with Video_TS folder on Samsung TV through USB, then you will have to change the format from Video_TS to a format playable by Samsung TV. Video_TS files are one of the main DVD folders in a DVD’s contents. Video_ts folder contains all the information of the DVD regarding its playback and data including information regarding backup files (.BUP), video object (.VOB) and information files (.IFO). Thus we can say that all the video related information in a DVD is stored in Video _ TS folder. DVD Player can directly play it on Mac/PC by simply dragging a whole VIDEO_TS folder to DVD Player. Since Video_TS are actually DVD videos, to convert DVD Video_TS folder to Samsung TV, you need to get a DVD file converter. Here Pavtube Video Converter Ultimate is highly recommended to help you finish the task. With it, you can fast convert Video_TS, DVD ISO/IFO, DVD disc, Blu-ray disc and even Blu-ray BDMV to Samsung TV compatible MP4 format while keeping the original quality. Encode WMV, MKV, AVI, FLV, VOB, 4k Video,ISO, RMVB, MXF, AVCHD, XAVC, MPEG, MTS, etc to Samsung TV. Convert almost all types of audio formats to Samsung TV like MP3, FLAC, AIFF, M4A , etc. Trim or crop video clips to choose and play your favorite Video_ts clips on Samsung TV. Merge or split video or audio files. Compress audio or video files to comparatively smaller size. Import downloaded subtitles and adjust video parameters to improve Samsung TV watching experience. Run the program and click “File” button to select and load the Video_TS folder to the program. As you can see, added files will be displayed on the left source pane and can be previewed on the right preview window. Though there are many titles in one Video_TS folder, usually you just need to choose the main title to rip. Click the “Format” to choose your desired format and then choose the right Samsung TV format from “TVs”. 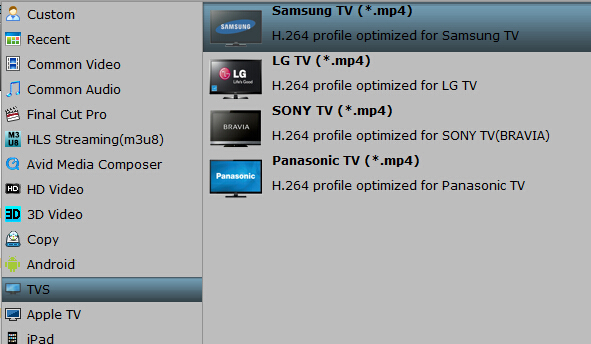 Hit the Convert button to start converting Video_TS image files to Samsung TV compatible MP4 videos. Once the conversion is finished, you will be able to get the output files via clicking on “Open” button effortlessly. Now you can enjoy the converted Video_TS files to Samsung LED/LCD/3D Smart TV for playback with great fun. Note: Does your Samsung TV have a USB port compatible with flash USB drive? Depending on the TV models, sometimes they are compatible with NTFS but most are not. To be able to access content of USB from Samsung TV, most times USB drive has to be formatted in FAT32.